Two years ago I put out a donation box, because the upkeep on our Christmas display has become very expensive and we keep growing every year. The first year few people noticed the donation box because I felt guilty about doing it, so I had it if off to the side. Last year I sold my surf memorabilia collection to keep this going. Our electric bill has been astronomical with PG&E sending us letters that they’re going to penalize us. Fortunately, I’m retired because during the last 3 years – 2015 thru this year 2017, I’ve spent the year working on our Christmas display. A lot of it is maintenance and upkeep and then there’s designing and building new displays and always lots and lots of painting and it all costs money. One of our biggest expenditures is our Christmas tree forest; artificial trees and they’re expensive. The majority of our trees are 12’ to 25’. Because it takes me 2 months to set up and a month plus to take everything down and store it, our trees are exposed to the weather for longer than normal periods. With the excessive heat we’ve had during our last Indian Summer’s and the extreme winters, our trees have taken a beating, which is shortening their life expectancy. At the end of our season last year we lost 4 of our largest tree’s, one of them was our second to the largest tree, which I called our SF tree and I was really sad to loose that tree because there’s a story with that tree along with my dog Ambush who has since passed away. I do spend months on end continually looking for closeout deals on artificial trees and most times they pop up in the most unlikely places: Pennsylvania – Tennessee! I’ve surfed my whole life, so I have a hard time comprehending that there are companies selling Christmas trees in places like Tennessee. To try and cut our electric bill, I’ve been buying only LED lights. The first years LED lights came out they were horrible – some only lasting hours, while others made it thru the season, but were dead when I went to use them the next season. 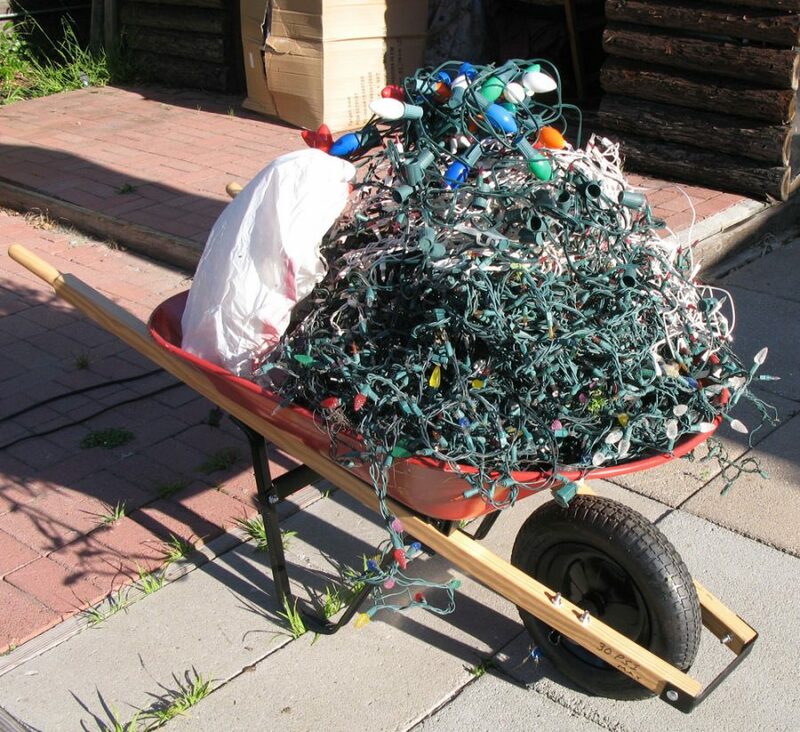 With as many trees as we have I can fill a trash can with dead lights every year. Another overlooked cost is propane. December being the coldest month of the year, I have propane heaters to keep warm and I can go thru a tank a night. Standing outside in the winter every night takes a toll. Unfortunately, we have no sponsors or receive any grants, so donations are very welcomed.